Are you a contractor who needs a steel detailing service? If yes, then I can help you. I have three steel detailers on my team. One of my detailers has 29 years of experience, another has 15 years of experience, and the other has 7 years of experience. That's right; my senior detailer has 29 years of experience. My people are qualified. I have a process to provide you with this level of service. We create structural steel shop drawings. Both erection drawings with a bill of material, and fabrication drawings (aka detail drawings and assembly drawings). We do so for architectural steel, miscellaneous metals, and structural steel. Our focus is on miscellaneous steel and small buildings. Items such as steel stairs, railings, ladders, catwalks, mezzanines, support structures, moment frame buildings, braced frame buildings, and etc. We have experience with commercial buildings, residential buildings, single family houses, industrial plants, subway tunnels, and waste water treatment plants. We use Tekla ®, AutoCAD ®, and Revit ® depending on the project. We typically service steel erectors, steel fabricators, and general contractors. Our product is great steel detail drawings. My team is finishing drawings weekly. If you visit the draftingservices.com Instagram profile, then you will see some current steel shop drawing samples mixed amongst other completed projects. Here is a steel detailing sample in PDF format. 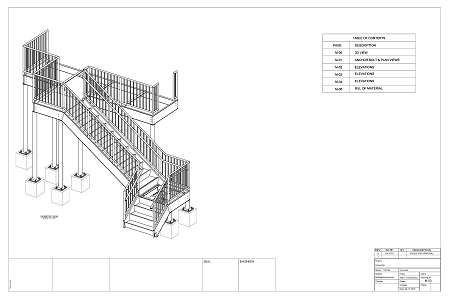 The drawings are steel stair shop drawings. These are erection drawings only. No piece / fabrication details were included on this project. The drawings were drafted in Tekla ®. Click image to launch PDF. Here is a steel detailing sample in PDF format. The drawings are of a steel stair tower. These are erection drawings only. The piece / fabrication details were released in a separate drawing package. The drawings were drafted in Tekla ®. Click image to launch PDF. As I said at the start, I have great People, a great Process, and a great Product. My steel detailing team would be a valuable asset to your business. Why don't you make your life a little easier, by choosing to use draftingservices.com as your steel detailing service? Let me put my People, Process, and Product to work for you.